Whether we identify as rural, urban, or suburban; as native, immigrant, or exile, we are marked by place and we make a mark on places we live by how we choose to live. This intersection of place and identity is reflected in the language we use and the stories we tell. 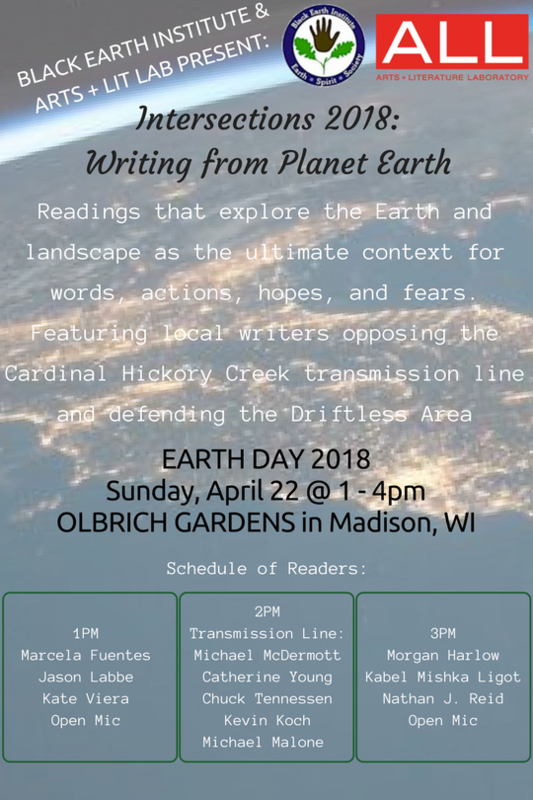 Join Black Earth Institute and Arts + Literature Laboratory at Olbrich Gardens on Earth Day, April 22 with a special reading. We will spotlight local writers opposing the Cardinal Hickory Creek transmission line and defending the Driftless Area. Michael Malone is a writer based near Chicago, IL who fell in love with Wisconsin as a youth as his family towed their pop-up camper behind a faux-wood paneled station wagon from Kenosha to Eau Claire, Plattville to Green Bay. For as long as he can remember, his love of Wisconsin and the outdoors has fueled his passion for protecting the environment. Kevin Koch teaches Creative Nonfiction in the English Department at Loras College, including such courses as Nature Writing and Writing the Midwest Landscape. He is author of Skiing at Midnight: A Nature Journal from Dubuque County, Iowa and The Driftless Land: Spirit of Place in the Upper Mississippi Valley, as well as nature-based articles and essays that have appeared in magazines and newspapers throughout the Midwest. When not teaching or writing, he can most frequently be found bicycling, hiking, or kayaking in the Driftless Region. Catherine Young is a geographer, farmer, and writer who lives near Blue River, Wisconsin. Her prose and poetry is published in the newly-released anthology The Driftless Reader and in literary journals nationally and internationally, including Fourth River, Minding Nature, Midwest Review, and The Island Review. She is a nominee for the Pushcart Prize and Best American Essays. Catherine writes with great concern for the intricacies of the Driftless bioregion, an area rich in biodiversity and water. She believes in the power of decentralized renewable energy and holds a way of life that shows it possible. Chuck Tennessen chairs Sustain Iowa County, a volunteer group that opposes Cardinal-Hickory Creek and promotes sustainable practices. As the Community Organizer for the Driftless Area Land Conservancy, the land trust for Southwest Wisconsin, he helps lead its efforts to stop this powerline proposal. Chuck will read an expanded version of an essay from his “Earthbound” column found in Iowa County’s leading news weekly. Michael McDermott is the co-founder and director of the BEI. He is chair of the Vermont Citizens Powerline Action Committee in western Dane County. He will give a brief overview of the proposed Cardinal Hickory Creek 345 KV transmission line proposed to go through the heart of the Driftless Area. He will read 2 poems by his BEI co-founder and late wife Patricia Monaghan calling on us to be guided by voices of Indigenous people’s stories.